Its time to add glass to your home decorating ideas. If you want a modern, sophisticated look, custom glass is the way to go. There are mountains of glass ideas to add to your home or office. From Glass wall cladding, glass splashbacks for the kitchen or bathroom, or outdoor glass applications including glass pool fencing and balustrading. You’ll be sure to find something that suits you. A Glass Wall is ideal for buildings with a beautiful view, swimming pool, golf course or garden views and landscaping. Bring the outside in with this option. Suitable for both modern and classic interiors it can divide a space while maintaining an open atmosphere. 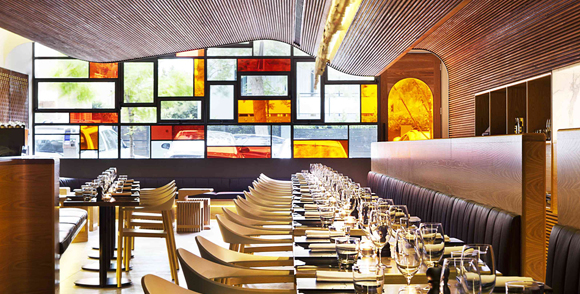 The glass wall (pictured) is located in Neutral Bay at a restaurant called Pony Dining. These different shaped glass panels along the front wall of the restaurant gives the space an interesting focal point and a uniqueness that you just don’t see anywhere else. This could also work in a residential setting, maybe not quite so large, at the end of a hallway or stairwell. Or a bathroom, where the glass could be textured to maintain privacy whilst still letting the light in. It’s an alternative to a plain painted glass wall which is popular with kitchen splashbacks. These are just a few options for glass walls. The possibilities are endless when it comes to glass. Feel free to browse through our portfolios to discover home decorating options that can be created for you.